Click HERE to read the entire 2018 Reflections Newsletter. Oh what a ride in pursuing the 2018 horsemanship theme of…Seeking Peace. It seems to me that it was around every corner, in every aspect of my life, and more than I care to admit, I found my internal voice saying, “I’ll be at peace once everything falls into place”, rather than listening to the horses and friends – my true spirit – saying “Start with peace, then everything will fall into place”. Time and again however, I was gently reminded to take that deep breath, look around at all of the things for which we have to be grateful, go back to basics, seek ‘balance’, and amazingly…Peace was found! It is not with surprise that those are the very themes that have become true to me after completing six years of Horse Study. I have witnessed an incredible group of seven women, who are now graduates, as they committed to a four -year plan to study the horse. The insight, wisdom, and knowledge that we all shared in this journey will forever change and shape our lives. I am extremely proud to have been allowed to share, and that you and your horses were kind enough to stick with me, even though at times my blankets had a burr or two, the ground poles seemed high, and my ‘musical elements’ were out of rhythm. You were there; You showed up; You remained loyal and together we experienced developing the ‘Art of Horsemanship’. Thank you! Now as we turn to 2019, what are the horses saying we should focus upon for this upcoming year. What are those little gems of wisdom we need to recall, reconsider in our daily lives, while being open to new understandings, new directions and paths? What is a theme we can return to daily to ground us, guide us, and ultimately repair and replenish us? Well here is what is resonating with me … Be open to being “In Love”. Think about for a while, then get back to me with you thoughts. I am anxious to find myself in a state of ‘being in love’…surrounded by good energy filled with gratitude, hope, strength, and in a state of peace. I look forward to riding with you all in 2019. I invite you to come be ‘In Love’. My journey during 2017 in ‘Seeking Lightness and Joy’ has been centered on two primary influences. First, the wonderful experiences gained through our Horse Study course coupled with the wisdom created by those amazing women and their horses. Second, my huge gratitude to Bettina Drummond and the Association for the Promotion of the Art of Horsemanship in America (APAHA). 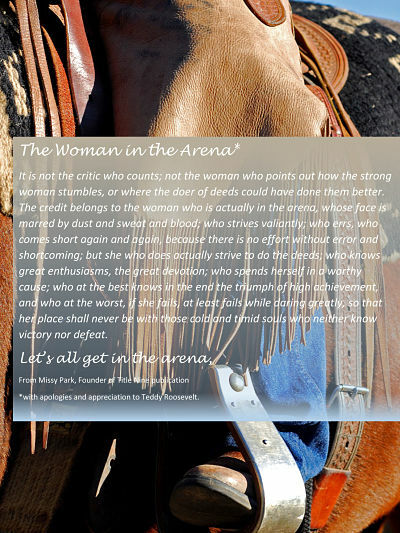 Janine Franco ~ Your application of the principles created such beautiful success in true partnership with your horses. Peggy Brennan ~ Your utter dedication to Ben (her mule) and constantly seeking to apply, feel, analyze, change, adjust, and grow will be inspirational to me always. Arylnn Hacker ~ What an amazing journey! My admiration for your commitment to Sprite (her horse), to studying, and finding what resonates between you and your horse is very deep. Thank you for sticking with me! 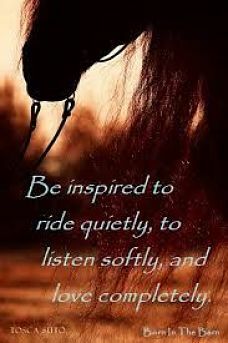 Betsy May Crawford ~ Your deep love of the horse, and ability to listening to what they are saying as individuals, then applying with care, is your path to true horsemanship. Happy teams created! Susan Triplett ~ I so enjoyed seeing your personal ‘attitude journey’ grow and evolve to establish an ever deepened appreciation of what the horse gives to you, in becoming a better human, and recognizing the pure joy of accomplishment, no matter how small. My journey for ‘Seeking Lightness and Joy’ with my horses is very tightly wrapped up in my interaction with all of the amazing women and their horses that are involved with Horse Study. While this is not the end of the trail for our 2017 graduates, nor will it be for those graduating in 2018, it is the recognition that we have influenced one-anothers lives, and by so doing have created pathways to look for joy in all situations. We have given each other tools such as simply hearing the word BREATHE to give back in a tense moment or tight feeling. We have pushed ourselves to read, watch, study, and observe, then struggle to apply, and finally felt the joy of finding at least a moment of lightness…In movement, in attitude, in emotion, and in spirit. Yes, Horse Study has helped me to find joy and lightness, and I will be forever grateful. Start thinking about it. I can’t wait to explore together with you in 2018. In 2016 our annual theme to contemplate was ‘Seeking Thin Places’. It was an incredible year and what we discovered is that once you decide to find ‘Thin Places’ with the help of horses, it transforms your perspectives, your attitudes, and your realities. Horsemanship is fluid. It bleeds. What an amazing world we live in, and what an opportunity we have to listen and learn and reflect, if we seek those ‘thin places’ where energy and the seeking of knowledge come together. Where we hear the voices of those on the other side of the veil and their spirit gives us direction. Listen…A life well-lived with the help of horses is calling! Sitting here, one day before Thanksgiving, I find myself reflecting on many aspects of this past year, and on this particular day – the day that our faithful horse Chance got his wings – I am truly needing to believe in the 2015 theme of Trusting in the Path. This is not a new theme for T&T and I am quite sure it was a voice I needed to hear throughout this entire year. We said farewell to my wonderful teacher Riddle this fall also. We raised her and from the time she was born she had a presence. Her horseanality was one of confidence, with a stride that could keep up with the Walkers, and a trusting attitude that always made me look so good. I remember a clinic in Corvallis, Oregon about 18 years ago, where Riddle and I were doing a presentation. Afterwards someone said of her, “That’s a push-button horse”. My friend Adelle commented back to the statement, “And Alice put every button in there”. I swelled with pride as I knew that Riddle was there as “MY” horse, and wanted both of us to do well. We had come to that place, that moment, together. She left this world to do some more teaching up in heaven, I am sure of it! All that she taught me and all we shared together allow me to Trust in the Path, even though my heart breaks. When Chance came to us, it was meant to be! About twelve years ago we held a Colt Starting clinic in Haines. A neighbor attended, bringing Chance, an 8 year old grey Arab-Quarterhorse gelding, that had been started at age 4, but didn’t have much work since that beginning. He was a gem! Beautiful black eyes, soft in his attitude and heart, with a real desire to do the right thing. The owner, Pat, sensed that there was a connection between Chance and Susan, and we were gifted this amazing horse. Over the years he never made a wrong move. He was Sabio’s best buddy, and these last couple of years, he was a great teacher to hesitant riders. This summer he was Carla’s savior by reintroducing her to the joys of riding outside the arena, in the mountains, with nature. What an incredible lightness he is taking into heaven, and I will love picturing him as that point of light, showing the way, allowing both Susan and I to Trust in the Path.